Looking for high quality tiles with style? MS International offers tiles that come in a wide range of bold patterns, interesting textures, and vivid colors -- all made with long-lasting materials. From modern to traditional designs or small to large projects, MSI has the perfect solution for your tile design needs. Welcome a whole new level of timeless beauty and classic design with MSI’s Arterra Porcelain Pavers. This large format tile features two beautiful styles that are super stylish and trendy. Enhance your outdoor space with the 16x32 Beton Grey tile. The blend of warm gray tones are perfect for stone-like appearances and look amazing as pathways or walkways. 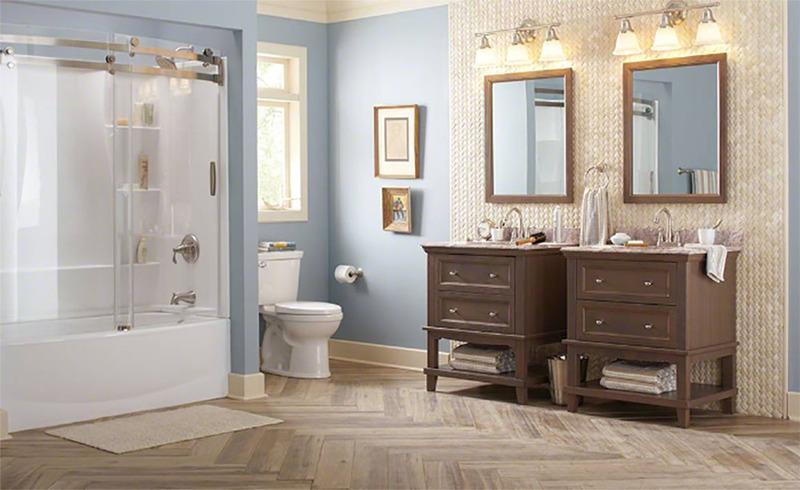 Because Arterra Porcelain Pavers are made from durable porcelain tiles, they’re long-lasting and easy to clean, making them an ideal choice for busy bathrooms and entryways. For an effortless transition between kitchen and patios, opt for Caldera Coala. 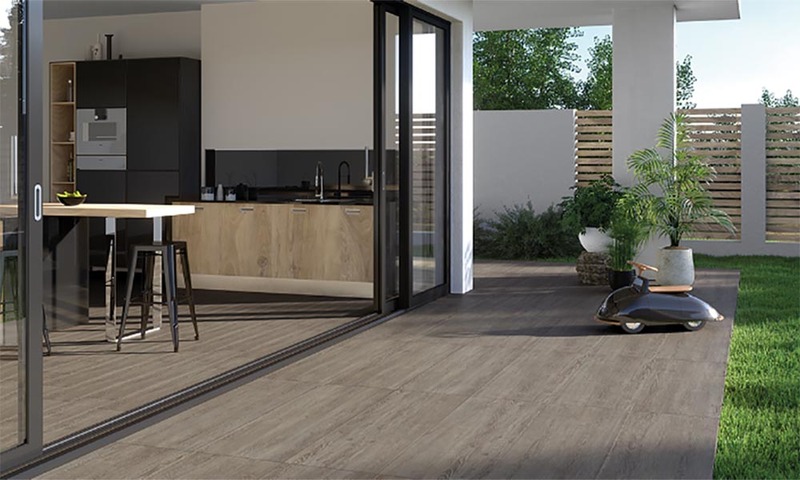 This beautiful dark grey wood-like porcelain tile makes it easy to blur lines and create a seamless transition between the outdoors and indoors. For a stunning look that’s sure to draw the eyes, apply the tiles from floor to ceiling. Complement the design with natural stone mosaic tiles for an earthly and refreshing look that’s incredibly pleasing. Add dimension and drama to your surroundings with touchable textures. With so many fabulous looks making headlines, MSI’s Arch Herringbone mosaic tiles are perfect for that modern day appeal. This three-dimensional marble tile adds warmth and edge to any space. The curved design gives an appearance of a woven basket that's well suited for residential backsplashes or commercial walls. For an “impossible to ignore” trend, install this unique tile in the fireplace or highlight the bar for a flattering yet elegant look. You can find this beautiful marble tile in the perfect shade of beige, gray and white. For a premium look that's sure to spark any imagination, pair this tile with wood-like floor panels in herringbone style. Take a shine on metallic mosaics! From warm golds to cool silvers, count on metallics to add energy and light in every room. Made from light reflecting glass, MSI’s Adara Interlocking mosaic tile features a striking combination of gray and silver tones that are sure to stand out. Amplify and brighten your bathroom by covering the shower walls with this beautiful mosaic tile for a breathtaking and sophisticated design. With a mesh backing making, it is easy to install. Adara Interlocking mosaic tiles are also easy to wipe down and clean. 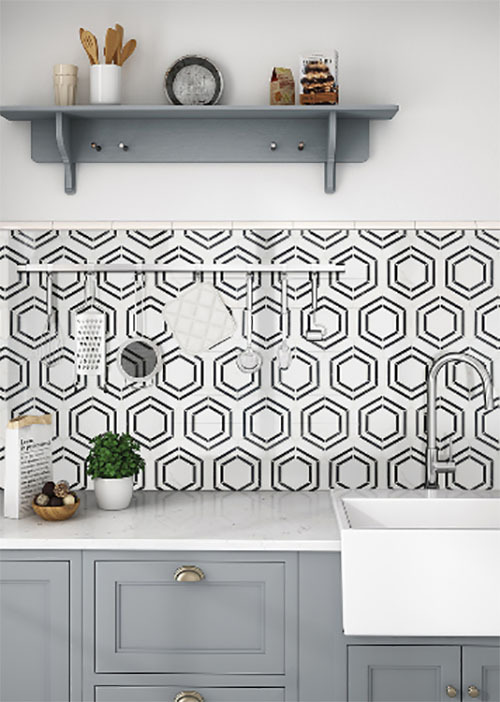 Take the tile to the kitchen by applying this lovely mosaic piece as a kitchen backsplash or countertop for an intriguing design. Take it a step further by applying Akaya Nero interlocking tile as an accent piece to fireplaces. This black and silver glass mosaic tile works beautifully with other natural stone tiles or slabs. Retro design trends have never looked more alluring than it does, now. MSI excels in providing architects, designers, and homeowners with the most up-to-date designs on the market. 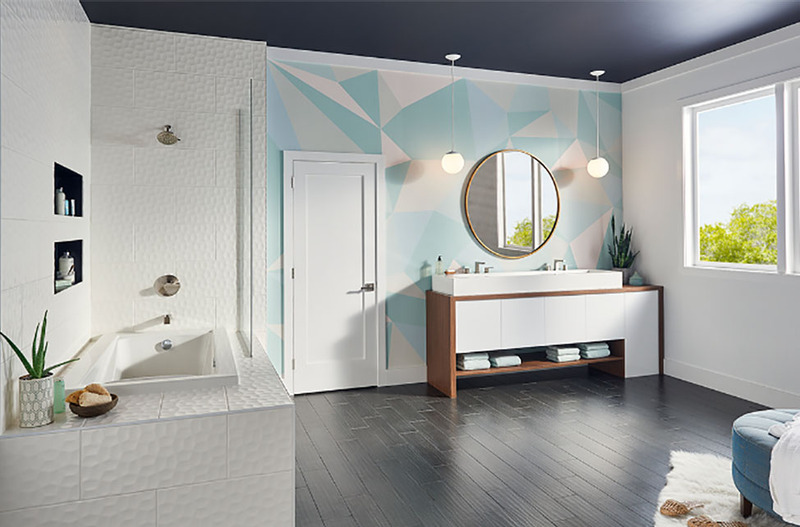 Created with modern materials and the latest technology, MSI’s expansive selection of rhombus, hexagon, and diamond-shaped tiles are among the most popular designs for interior designers. Bring nostalgic design with a fun twist into your home with MSI’s Georama and Hexagono collections. The collections are suitable for both residential and commercial buildings, whether on walls, flooring or countertops. 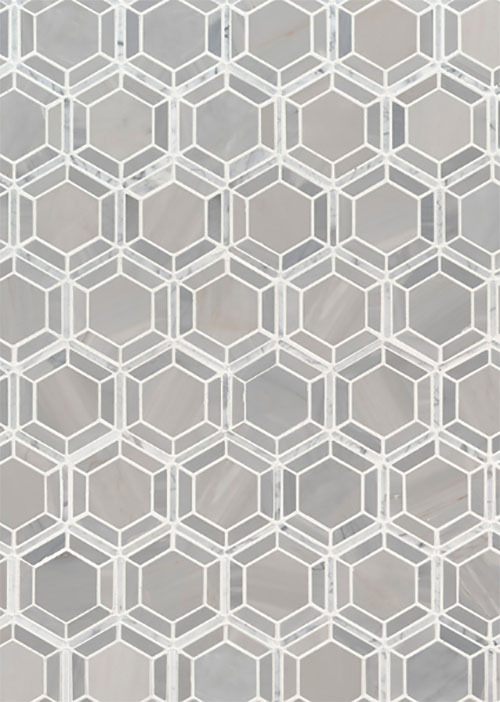 Opt for the Georama Grigio polished mosaic tiles. Its natural marble is incredibly beautiful on bathrooms and spa walls. 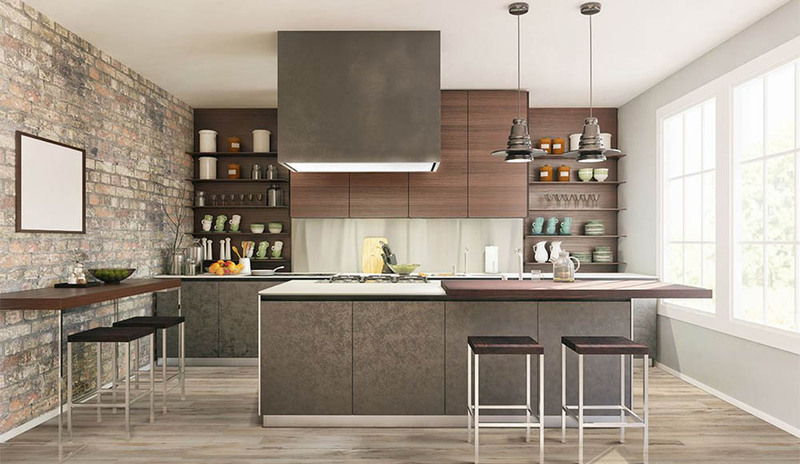 Use as a backsplash in an industrial chic kitchen for the best placement that’ll definitely add a beautiful pop of color. You can count on MSI tiles to bring out the best in every tile. MSI’s Everlife Luxury Vinyl Tile (LVT) are a designer’s dream come true. The collection offers beautiful wood-look luxury vinyl planks that’ll stand up to any busy home or light commercial spaces. Everlife LVT are affordable and will retain its beauty over time, giving you the fresh look of genuine wooden planks without sacrificing comfort or style. Place the tile throughout your home for a beautiful consistent look or install them in areas that tend to have high foot traffic. The innovative material not only provides superior durability but can resist moisture and chips or cracks for years to come. It's no wonder why designers are going crazy over LVTs’.